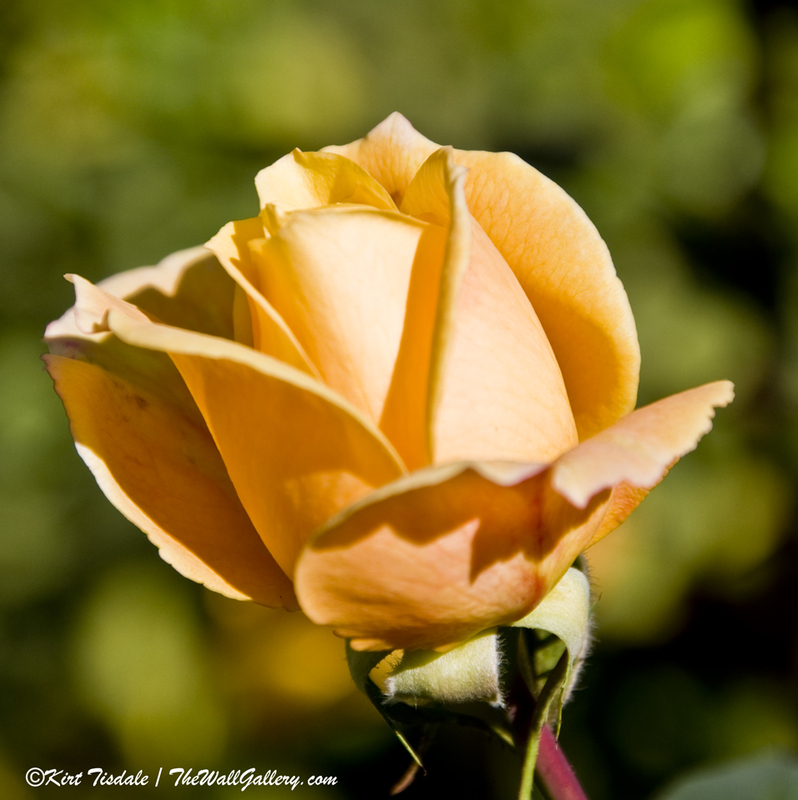 This entry was posted in Art Prints, Color Photography and tagged art gallery, art prints, artist kirt tisdale, color photography, flowers, interior design, photographer, photography, rose bloom, rose bud on December 29, 2014 by Kirt D Tisdale. 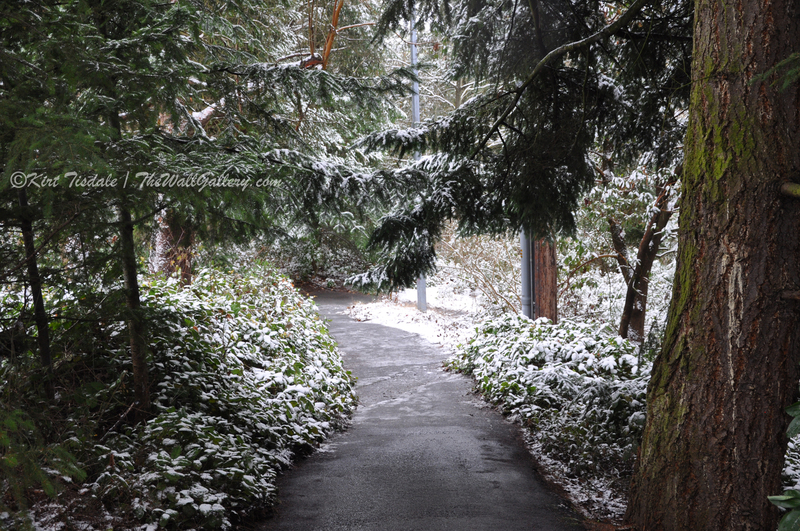 The excerpts from a photo shoot I want to share today are from the first snowfall in Seattle last year. It was the first week of December and very welcomed by us having lived in San Diego for many years. Yes, I know it’s August and here I am posting snowfall pictures, but our friends down under can appreciate it, as this is their winter. J Each week, I go through different photo shoots to determine what I want to blog about. This week was a no brainer for me, as I have been working with pictures from this shoot for the last few weeks. A fellow blogger had asked me about Christmas cards from my Note Card Collection. I had responded that I had done a private selection last year for family and friends, but hadn’t thought about putting anything up for this year. To be honest when you are in 107-degree temperatures day in and day out, Christmas seems like a life away. Yet, the request was enough to start my mind thinking back to a series of shots I took while we lived in Seattle last year of the first snowfall, which led me to revisit that shoot and start working with it. 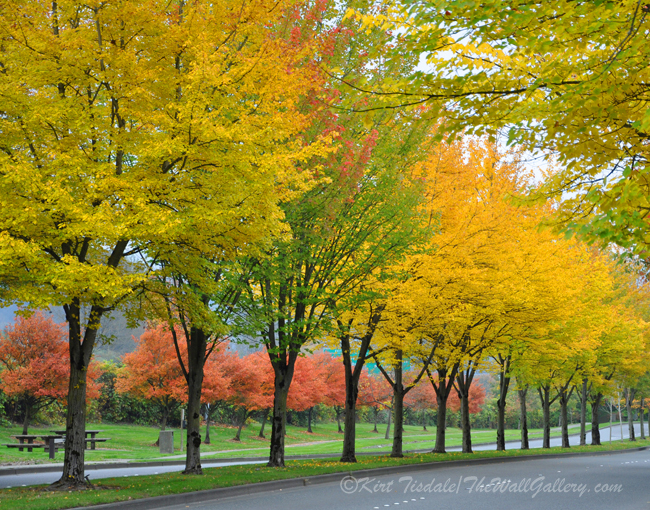 From that, I came across these two shots and wanted to share them as I created two prints I will be putting into my Landscape Oil collection. 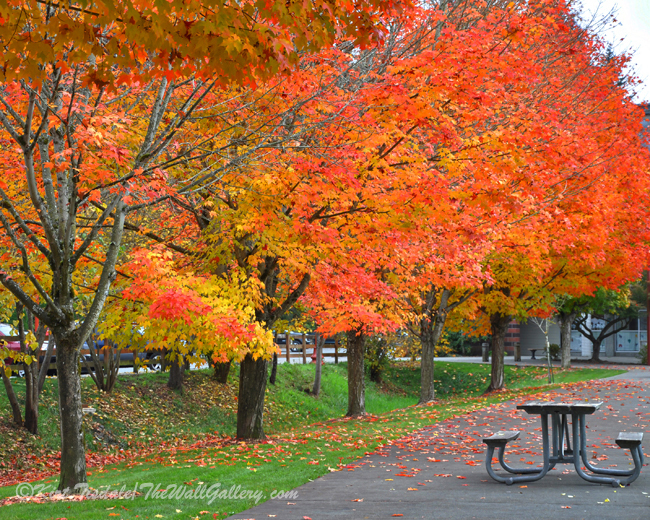 The setting is a paved path on the campus of a junior college near where we were. Following my prior blogs of getting numerous shots and playing with depth and composition, I narrowed it down to these two shots to work with. Taking each shot as a basis, I used an oil painting technique to create the final prints. The first two pictures are the original shots. I took both from the same position with 1st Snowfall #1 being a normal range composition. For 1st Snowfall #2, I have not moved an inch, but zoomed in slightly to play with the framing of the shot. As a reference point, look at the electrical poles in both pictures. OK, two shots from same location and they look very similar, yet look at the slight difference in lighting. This element plays a large part in the final art prints as it creates two very different looks to the same setting. 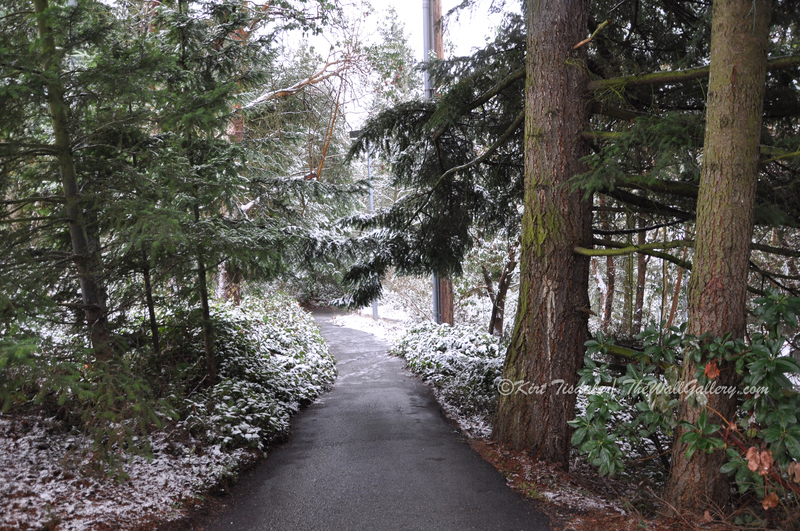 1st Snowfall #3 creates an element with a longer path winding its way through a forest. The light dusting of snow is still evident, but the colors of the woods become more prominent. 1st Snowfall #4 creates the illusion of coming out of a darker forest into a bright meadow where the anticipation of a snow-covered landscape becomes more prominent. In summary, sometimes it is the little things that make a difference and this is another example of having multiple shots to work with for your final product. Thoughts? 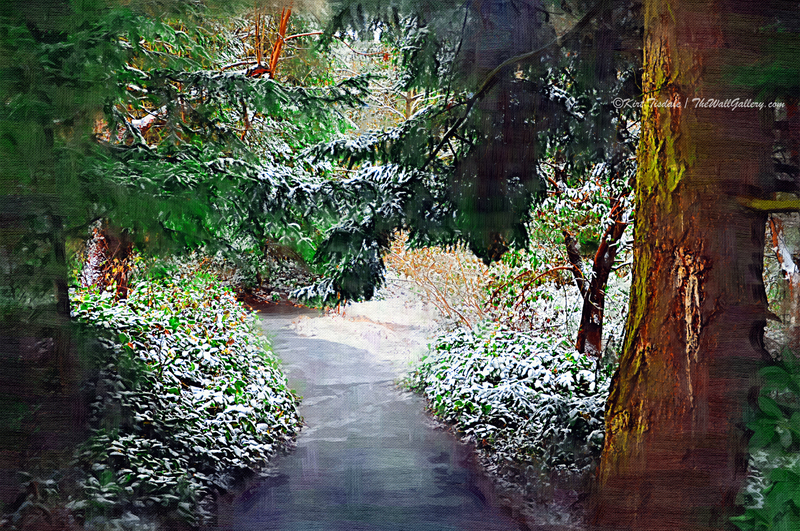 This entry was posted in Art Prints, Color Photography, Landscapes: Oil and tagged artist kirt tisdale, color photography, forest, interior design, landscapes, oil painting, online art gallery, snow covered trees on August 13, 2014 by Kirt D Tisdale. 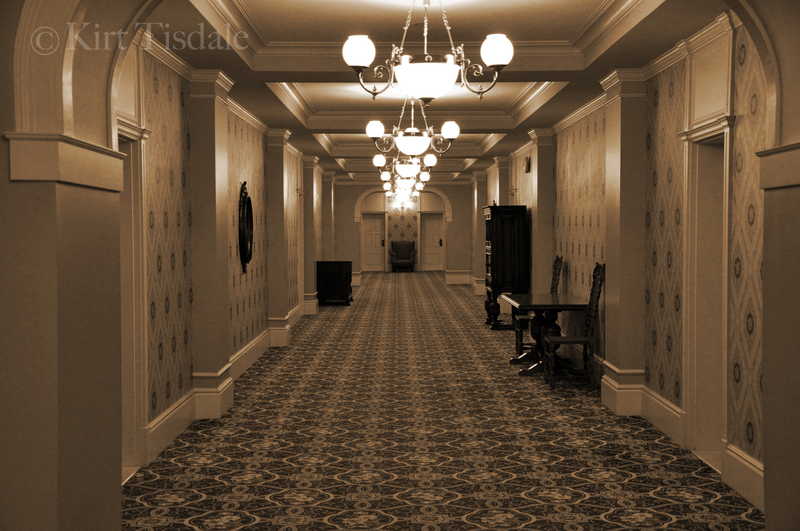 The excerpts from a photo shoot I want to share today are of a hallway in the Fairmont Empress Hotel in Victoria, British Columbia. The shot was taken a few years back on an excursion to that beautiful city. We stayed at the hotel and enjoyed the Victorian elegance and tradition it is known for. You might ask me what why I took a shot of a hallway and that would be a legitimate question. It’s the visual depth the architecture of the hallway has. I actually took a number of shots; vertical, horizontal, zoomed in, normal, etc. All of that said, I haven’t done anything with the shots until now. 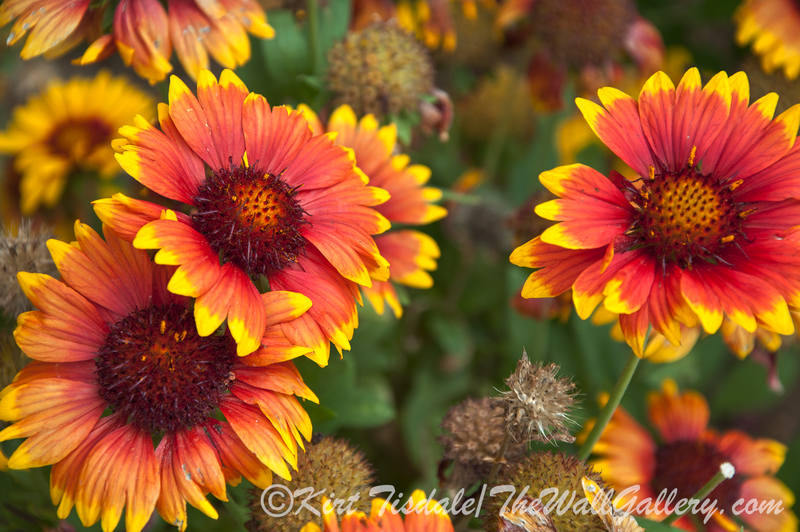 I came across them recently and find them intriguing, so I thought I would use this one in particular to demonstrate an example on how you can take one photograph and create a variety of looks of the same subject. The first shot is the original. I didn’t use a flash and depended on natural lighting. It isn’t the most technically correct shot, but it does have an interesting element to it (and yes the hallway really is that wide and that long). The natural lighting creates a shot with strong golden hues. 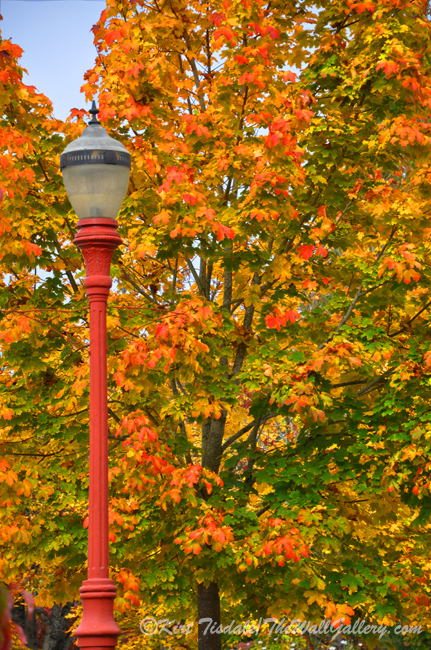 The color works with the style as it lends to a warm comfortable feel. The second shot is with a sepia tone. 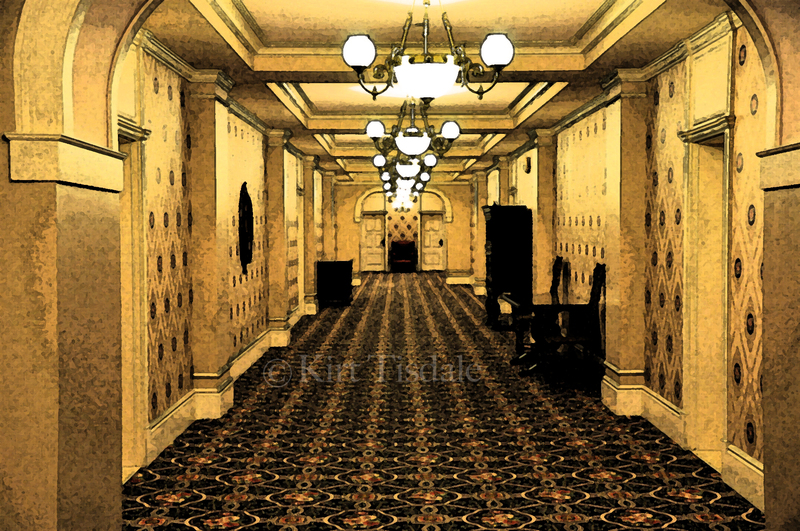 The sepia tone element is easy to do and lends itself well to the age of the Victorian hallway. Using this tone plays on the history of the Victorian Era. The sepia format was the look of photography in that era. The third shot is in black and white. The black and white aspect doesn’t play to the style of the hallway and the era it depicts, but to the architectural elements of the hallway. The strong lines and contrast work very well when you take a color photo to the world of black and white. Notice how it presents a totally different look to this shot. With the fourth shot, I went a few steps further. As I have stated, I haven’t done anything with these shots, but there is an element to them that appeals to me. Trying to figure out how to pull that out in the best manner to tell a story is the fun part of what I do. A lot of it is trial and error with most of it being archived or deleted. With this last print I used a fresco watercolor technique highlighting the architectural lines and the warm golden tones. From one photograph, we now have four different looks to the same hallway. Two of the three changes were easy with the fresco watercolor a little more challenging. Thoughts? 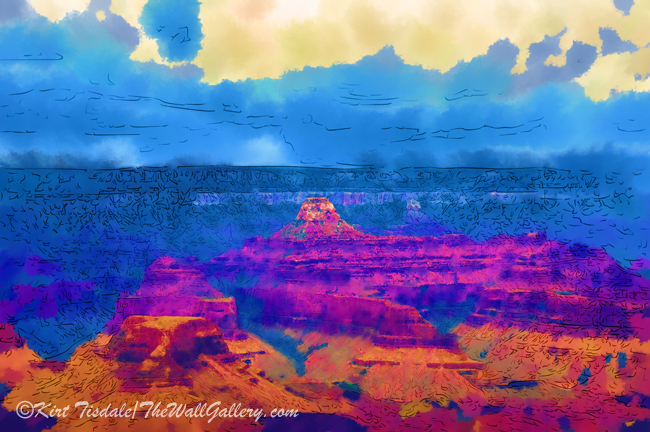 This entry was posted in Art Prints, Color Photography and tagged black and white photography, color photography, interior design, kirt tisdale, photographer, photography, sepia tone, Victorian, watercolor art on August 6, 2014 by Kirt D Tisdale. 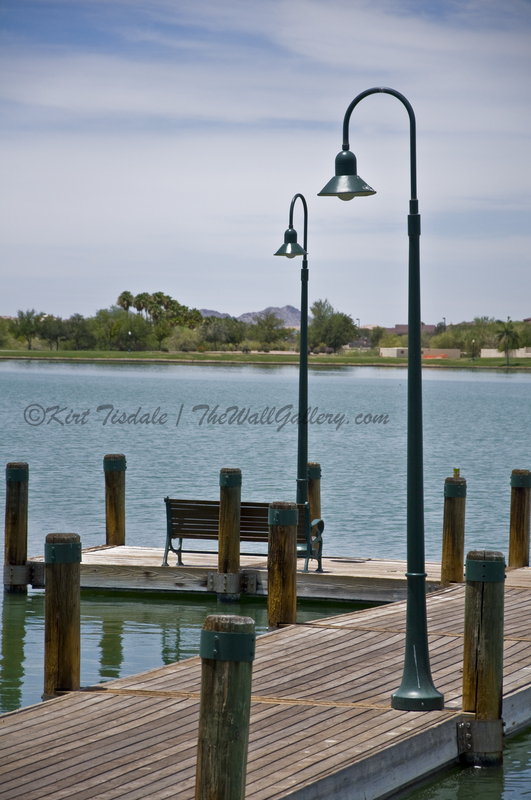 The excerpts from a photo shoot I want to share today are of a dock on a lake. On a photo shoot from a few months ago, I took numerous shots that I started sharing last week. The shoot was around a small lake near our house. The focus this week is the dock on the lake. I have attached three photographs of this dock. The point of discussion is the variety of shots you can get centered on the same subject matter. Each of these shots has a different look and tells a different story, yet is of the same dock on the same lake. The first shot gives you a point of reference of the dock as it pertains to the lake. You get a feel for the size of the dock and the general feel of the lake. The dock itself isn’t large, nor is it one of many. From this perspective, the dock is center of the frame, but what really becomes the focal point. Is it the lights along the path, the hill in the background or the dock? As you look at the composition of this shot it encompasses all of these elements….again, no right or wrong depending on what you want to portray. The second shot zooms in on the dock. The benches on the dock become more prominent, but so do the homes on the surrounding shoreline. 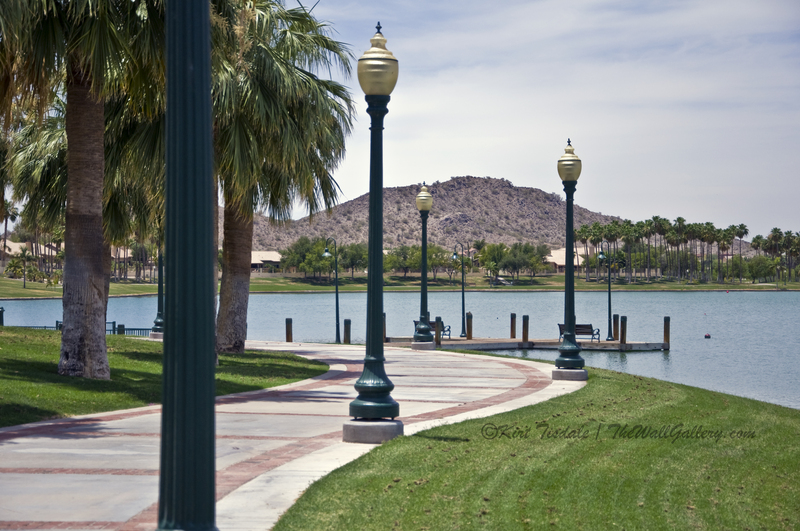 The composition of this shot has the dock with benches front and center. It also has the same hill in the background and homes along the shoreline…again, no right or wrong depending on what you want to portray. The third shot puts the framing vertical instead of horizontal. One of the benches takes center stage and the lights on the dock become more of an important element. All three photographs are well composed, but tell different stories. I put this out there as food for thought as you are taking photographs and trying to figure out what you want the final result to say. By taking numerous shots from different angles, it gives you a pool of pictures to review and determine which one represents the story you want to tell. As a side note a couple of these shots looked better in a black and white format due to the elements within the shot….any idea which two? Thoughts? 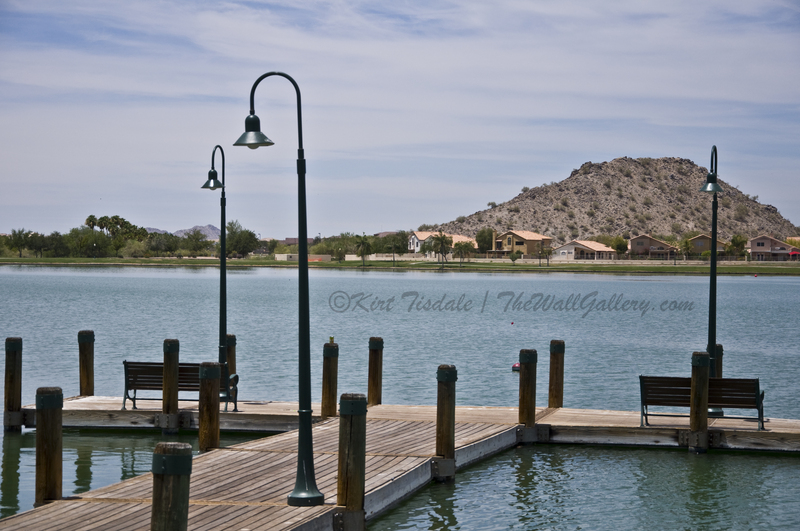 This entry was posted in Color Photography and tagged art gallery, boat dock, color photography, interior design, kirt tisdale, lake, outdoors, photographer, photography on July 30, 2014 by Kirt D Tisdale. The art print I wanted to feature today is from my Color Photography Collection titled “The Lighthouse Life”. The print is a color photograph of a lighthouse sitting on a bluff overlooking the Pacific Ocean along the Oregon Coastline. 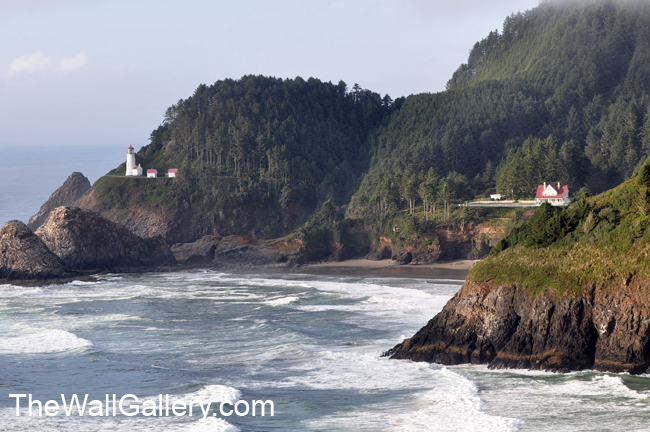 The lighthouse in this art print is the Heceta Head Lighthouse. Located along Pacific Coast Highway on the Oregon Coast, Heceta Head dates back to 1893. The setting and views are incredible with the lighthouse situated on a bluff rising 205 feet above the ocean. The structure in the right portion of the art print is the Light Keeper’s house. A path connects the two structures and there is also a path down to the beach. Both structures were placed on the National Register of Historic Places in 1978. From 2011 to 2012, the lighthouse structure itself was closed for restoration. It was officially Re-opened to the public on June 8, 2013. This particular lighthouse is considered one of the most photographed lighthouses along the Oregon Coast. There are a couple of reasons for this. The first reason is the setting itself with the lighthouse perched on the point above the surf of the ocean. The second reason is the ability to see the lighthouse setting from the south along the coastal highway. A number of lighthouses can only be seen when you get to them, not many can be see in such a panoramic manner. I have used this particular photograph as a basis for paintings in my Lighthouse Collection using both oil techniques and watercolor. Thoughts? 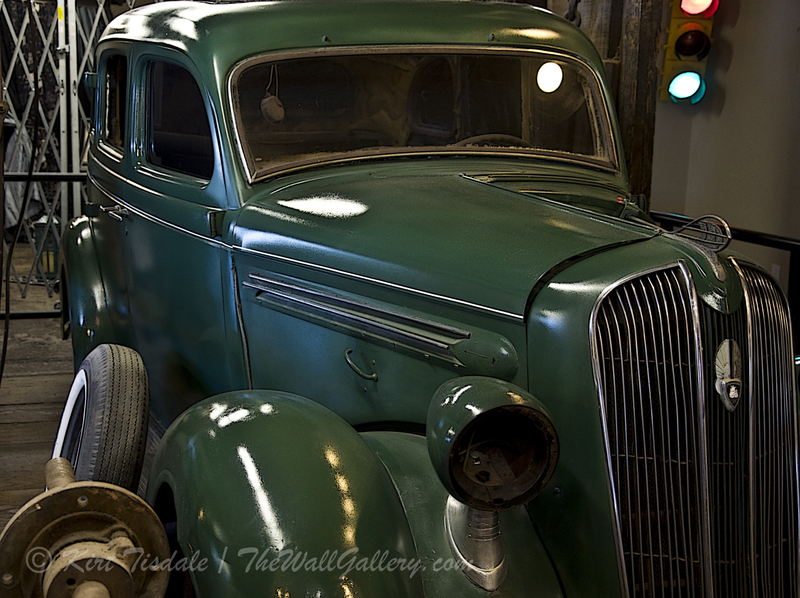 I invite you to come into the gallery to view the new additions to the collection in Color Photography. 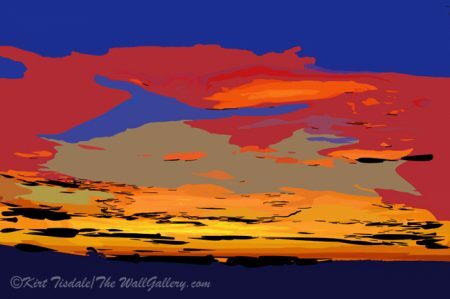 This entry was posted in Art Prints, Color Photography and tagged color photography, interior design, kirt tisdale, lighthouse, lighthouses, online art gallery, oregon coast, photographer, photography on July 25, 2014 by Kirt D Tisdale.